A century ago, the Sykes-Picot agreement was signed, carving up parts of the Middle East between French, British and Russian spheres of influence in the event that the Ottoman Empire collapsed. That agreement led to the formation of a number of states – as preferred by the British and French, and had a profound influence in shaping what the region looks like today. The sponsors of Sykes-Picot imposed a nation state system that has not served the interests of the people of the region. Also a century ago, penned in November 1917, the Balfour Declaration promised the Zionist movement that the British supported the creation of a Jewish state on land whose residents were not consulted. A hundred years later, the state in the Middle East and North Africa (MENA) region is in crisis, and substantial credit for that is due to these two documents. Recently, the MENA uprisings that began in December 2010 have had a massive impact on the social contracts that previously governed state-society relations. While the gains of the uprisings (except in Tunisia) have largely been reversed, or have led to civil wars, some elites in the region sought to protect their states by quelling dissent through financial incentives; others intensified the repression that had already existed. While the region remains fragmented, most states find themselves floundering, and governance has effectively collapsed in Yemen, Libya, and Syria, there are also attempts to create new states, with varying degrees of recognition by the international community. Sections of the Kurdish population; the Palestinians; the Saharawi; and the Islamic State group have all either attempted to create states, or to get recognition to formalise states which do not exist in reality. The concept of the state is a contested one in political theory and international relations, with various understandings of what criteria are sufficient for a state to exist, the role of recognition in the existence of states, what defines a state as a person in international law, the role of the economy (and capitalism) in defining a state, and so forth. Some of the contestation is ideological, and related to the limits on the roles and functions of a state. The role of the United Nations in defining and recognising states became crucial in the second half of the twentieth century. Nevertheless, criteria are not always applied uniformly or universally, and, often, dominant states bend definitions and offer or withhold support on the basis of their interests rather than any theories or agreed-upon definitions. Although still contested, perhaps two understandings of the state that have become most accepted are those of Max Weber and the 1933 Montevideo Convention. Weber argued that the state was a political organisation with a centralised government ruling over a given territory, and where that organisation holds a ‘monopoly of the legitimate use of physical force’ in the enforcement of its order. The Montevideo Convention on Rights and Duties of States defines a state as a space possessing a permanent population; a defined territory; and a government capable of maintaining effective control over the territory, and of conducting inter-state relations. The questions of whether and how these approaches apply to states in the Middle East before 2010 – and since – will form part of the deliberations at this conference. Studies of state formation in the MENA region have, in the main, focused on two key elements: political economy and social factors. The former includes the provision of rents (especially through oil resources), and ‘strategic rents’ (financial and military aid by international powers), and the influence of these on state formation. Social factors refer, inter alia, to cultural aspects and the importance of tribal affiliations in inhibiting the formation of a national identity and in enabling the provision of services on a local basis. Both these elements have allowed most MENA regimes to shun accountability to their citizens; and the provision of services by the state has often been diverted toward wealth accumulation for elites. By 2010, in many MENA states, national identity and domestic state formation was circumscribed. Rampant corruption and increased securitisation, coupled with the 2008 global economic crisis and implementation of structural adjustment programmes saw the collapse of the autocratic bargain that resulted in populations tolerating repression and lack of political freedoms in return for (real or imagined) economic growth. 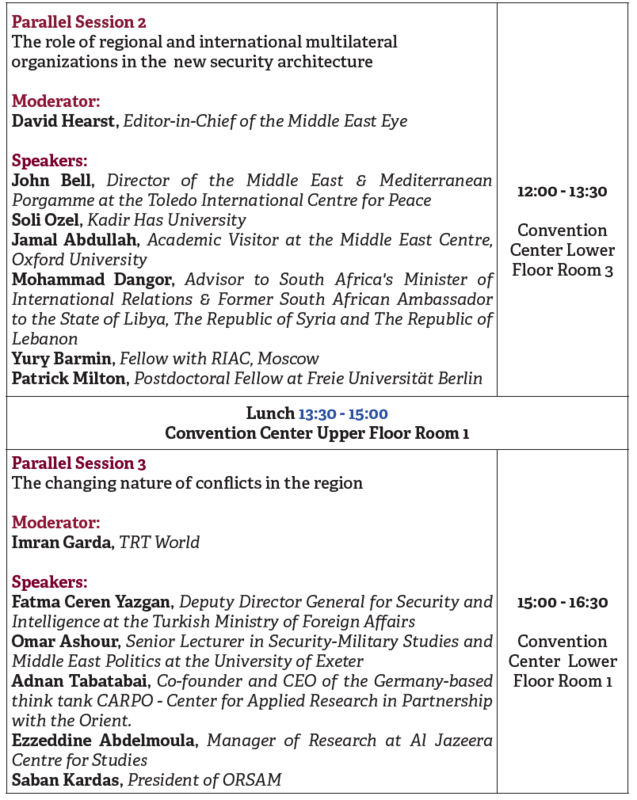 The Afro-Middle East Centre’s conference on the future of the state in the MENA region will consider these debates regarding the concept and formation of a state, and academics, policymakers and activists will deliberate on the current and future position of the state in the region. How healthy is the nation state project globally? The collapse of regional order has made the security failures of the Sharq region ever more apparent. State failures, violent extremism, the emergence of militia groups as prevalent regional forces, chemical warfare, and the arms race are among the security problems, which call for the development of a new security architecture for the MENA region. The phenomenon of the failed state as witnessed in Syria, Iraq, Yemen and Libya triggered the rise of violent extremism and militia forces as new security apparatuses in the region. The legitimacy concerns surrounding non-state actors, given their prevalent terrorist actions across the region, make determining legitimate actors of the new security architecture even harder. The long-standing crises the region has been suffering seem to have created support for autocratic regimes and whether the foreign powers favored these regimes is an issue that should be discussed. In efforts to map the road ahead for establishing the new security architecture, the role of international powers is of paramount importance especially in the issue of implementing economic and political cooperation. Additionally, the regional leadership is needed in consolidating counter-terrorism efforts without resorting to proxies to end sectarian divisions in framing this new structure. The region witnessed change in the nature of security apparatuses and the nature of conflicts. Energy resources, nuclear efforts, technological developments, and even social media became sources of conflict, let alone the emergence of new characteristics in warfare and type of militarization. In order to determine a well-functioning new security architecture, understanding the nature of conflicts is a must. Yet, amid this surge of conflict, the issue of human rights and its importance in the new security architecture should not be overlooked. Peoples of the region have deeply suffered from the use of chemical weapons, asymmetrical force and continue to be exposed to surveillance that overrides the right to privacy. To find solutions to breach of rights, the integration of human rights into this structure through international and regional conventions should be debated. The new security architecture also needs to lay grounds for law enforcement in complying with human rights and citizenship rights in the region. The role of regional and international multilateral organizations is another point of debate. The new structure need to assess the role that global institutions such as the UN, UN related bodies, NATO, OSCE and regional institutions including the Arab League, the OIC and the GCC should play in the region. 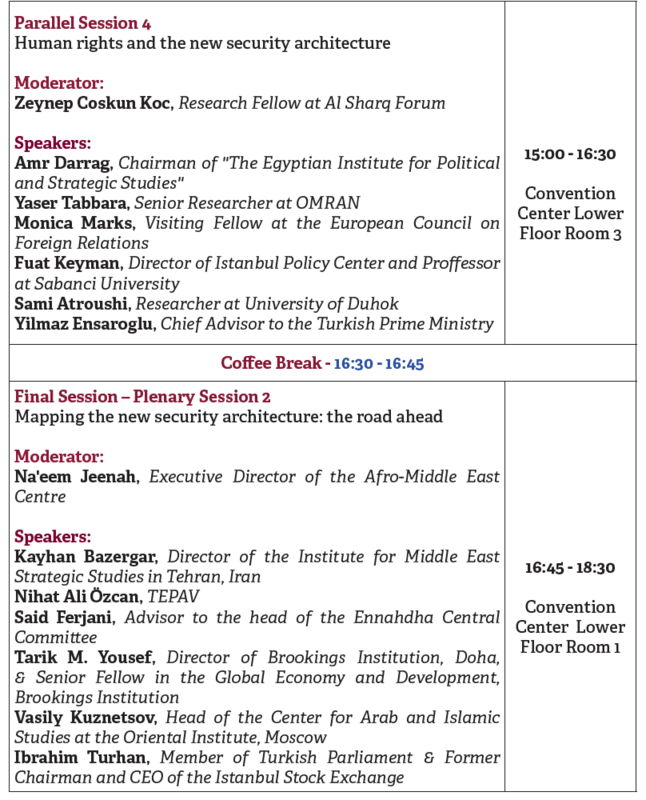 This conference organized by the Al Shaq Forum and Afro Middle East Center (AMEC) partnership will bring together experts, policymakers, and current and former officials, as well as representatives of international agencies, to share new perspectives and provide new insights on the aforementioned security issues in order to suggest frameworks for a new security architecture in the MENA region. The collapse of regional order has made the security failures of the Sharq region ever more apparent. State failures, violent extremism, the emergence of militia groups as central regional forces, chemical warfare, and the arms race are among the security problems of the region which call for the development of a new security architecture for the MENA. 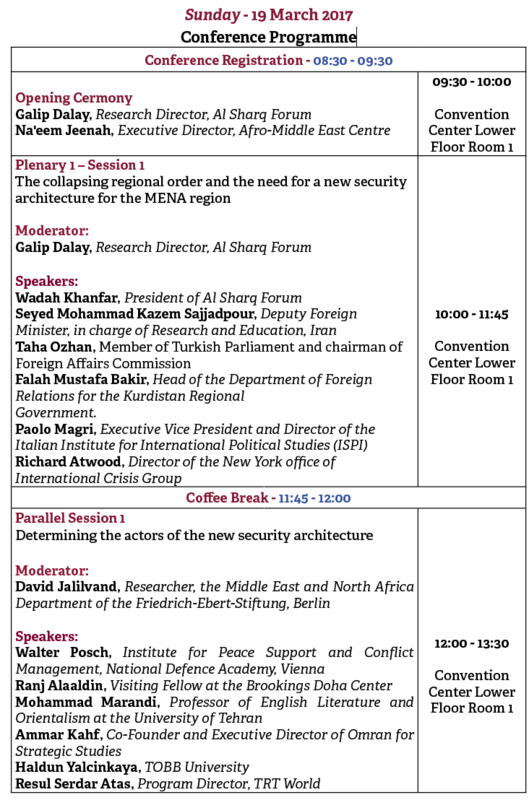 This conference will bring together experts, policymakers, and current and former officials, as well as representatives of international agencies, to share their perspectives and provide new insights on current security issues and suggest frameworks for a new security architecture in the region. Dictatorship vs. democracy: Are the long-standing crises in the region creating the backing for autocratic regimes? What is the role of military alliances and aid in fueling current military conflicts and security dilemmas in the region? What should be the pillars of the new security architecture? : Economic, military and/or political cooperation? c) What should be the balance between the integration and elimination of militia groups vis a vis the new security architecture? What can the Arab League, the OIC, the Maghreb Union, the GCC and the African Union offerthe new security architecture in the region? What can the UN and other related bodies offer the new security architecture? Can NATO, OSCE or the EU provide frameworks for the new architecture? Can multilateral organizations help prevent the use of armed groups as proxy war and foreign policy tools in the region? What can be the mechanisms to enforce human rights in the new security architecture? How to determine the moral and ethical pillars of the new security architecture in the region? Where is the line between lawful surveillance and the invasion of the right to privacy? Which states, actors and organizations should/could be at the nucleus of the new architecture? How essential are economic and political cooperation as complementary efforts towards the new security architecture? What role can international powers take in the new architecture? What are the ways to end the sectarian divide under this new security framework? How can we prevent the use of non-state actors as proxy war and foreign policy tools?